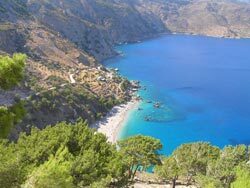 Karpathos, an island ideal for peaceful vacations, has an exceptional landscape beauty, due to the fact that it pulses with picturesque beaches and has many morphological alternations, as the southern part is plain while the central and the northern part are mountainous, composing a peculiar but interesting icon. The island of Karpathos belongs to the Dodecanese Islands cluster and it located at the southern part of the cluster, very close to the island Kassos. 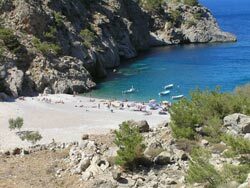 Karpathos covers an area of 301 m�, has a coastline of 160 km and has 6.500 inhabitants. The highest mountain of the island, Kali Limni, is 1.215 meters high. 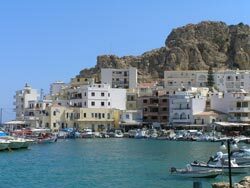 Karpathos or Pigadia is the capital and the main port of the island where the imposing rock with the ruins of the acropolis prevails. At this beautiful settlement with the traditional houses you will also see the church of Agia Kyriaki, the ruins of the paleochristian basilica of Agia Fotini, the pine forest and the cave of Poseidon. 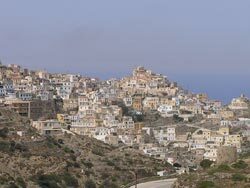 Apart from the capital, the island of Karpathos comprises of numerous other interesting settlements. Ammoopi, Makris Gialos and Lefkos, three tourist resorts with amazing beaches, Aperi, the old capital that is a cultural settlement with many sightseeing and Arkassa, an impressive settlement of natural beauty, are worth visiting. The amphitheatrically built and picturesque village Menetes, Messohori, which is hanging above the sea offering superb view to the sunset and the sea, as well as Othos and Olympos, two traditional mountainous villages in the heart of the untamed scenery, shall definitely enchant you.